For the last week, I have been thinking of what to write about for my first post on an internet blog. Since the practice of blogging usually seems personal, I decided to write on experiences that contribute to the thinking process that promotes the art-creation process. I’m intrigued by creativity: where do ideas come from? I thought that by blogging on readings, exhibitions, and other input that spark thinking, we might shed a bit of light on the output. For my 30th birthday I booked a ticket to Berlin to visit two concurrent exhibitions at the Kunstmuseum in Wolfsburg: Rudolf Steiner’s first retrospective (originally organized by the Vitra Museum in Basel): “Alchemy of the Everyday” and an exhibition on his influence on contemporary artists: “Rudolf Steiner and Contemporary Art.” In due time, Steiner got the institutional recognition he deserves. How to summarize Steiner’s cross-platform work as an agriculturalist, anthroposophist, architect, artist, educator, entrepreneur, esotericist, medical researcher, philosopher, set designer, writer, among many other ‘titles’ in a short blog post? Examples of his work can be found online at “The Rudolf Steiner Archive”, The Goetheanum Official Website, and The Waldorfschule Main Site (German). Through his many facets, Steiner’s life exemplifies his theories on the complexities of humanity and leaves us with a basic premise: the perception and sensibility to an infinite universe should be explored outwards as well as inwards. Steiner has a divided public opinion. Some complain about his multifaceted lifestyle for being apparently superficial and about his esoteric thoughts, and his techniques on how to connect to higher worlds or to guardian angels surpass most people’s ideas of what a scientist, doctor, or an architect should be. At the least, he fearlessly steps out of our robotic conventionalities in an effort to redefine our creative capabilities. 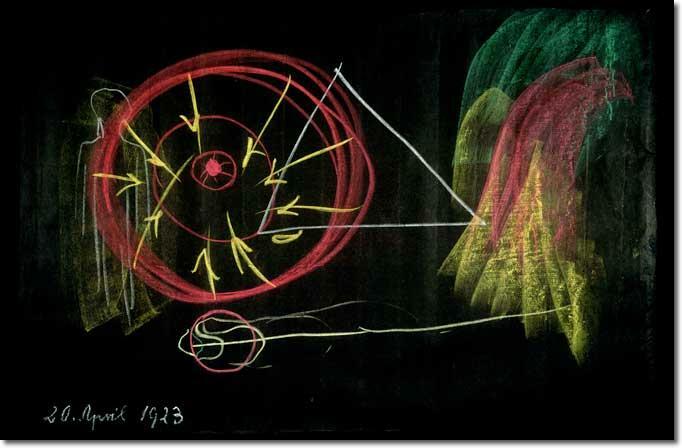 Rudolf Steiner: "Je weiter sich der Mensch von der Erde entfernt" (The farther man moves away from the earth) Chalkboard Drawing 104 x 154.2 cm. 20 April 1923. Clear consciousness is dependent on katabolic processes, on the demolition of matter. ...a person who eats potatoes is constantly stimulated to think. He can’t do anything but think. That’s why his lungs and his heart become weak. Tuberculosis, lung tuberculosis, did not become widespread until the potato diet was introduced. And the weakest human beings are those living in regions where almost nothing else is grown but potatoes. Nevertheless, a few of his projects endure: there are almost one thousand Waldorf Schools around the world; Weleda, a company dedicated to skin care products and holistic medications, has been in business since the late 1920’s; and his second Goetheanum (the first one burnt out) is still standing! 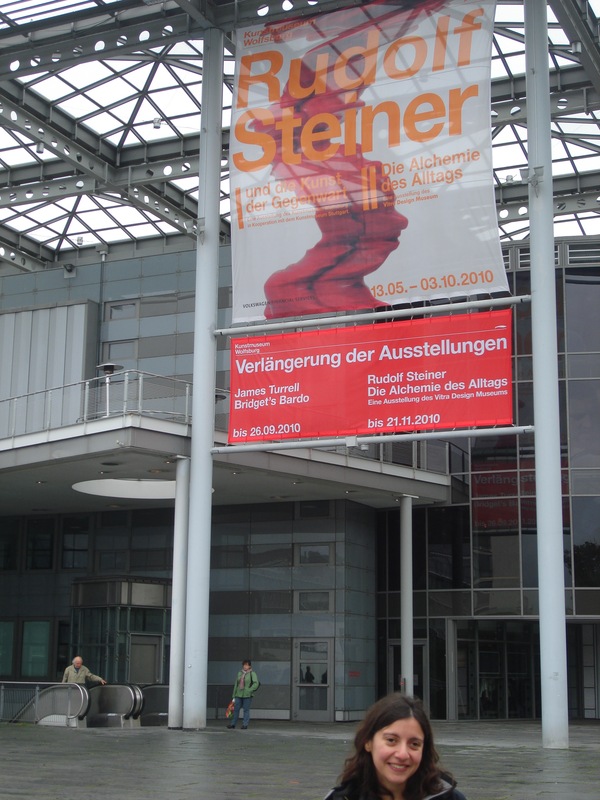 His aesthetic influences were clear in the exhibition I saw in Wolfsburg, which included artists Joseph Beuys, Mario Merz, Tony Cragg, and Olafur Eliasson, among others. And, sadly, we still have a long way to go until we fully implement some of his other theories like the ones on Social Finance, or Biodynamic Farming (organic agriculture). In the creative process, there’s always what feels like stepping into the void. There’s a blind move, a risk into the unknown. Even if there’s little scientific evidence to back many Steiner theories, others endure. Some endure not just through a rational scientific backing but through our experience. The development of the arts, the respect for nature, and the intent to make conscious decisions when it comes to financial matters, make life more endurable. Even though Steiner shows us that the creative path may sometimes be clumsy, graceless, and often exposed to a compassionless public opinion, I hope to follow, at least a small part of it, during my life-span. I had the same thought the last time I was in Walmart! I loved this post and have meant to comment for some time. I think the connection between faith and art is pretty huge; only slightly delusional people do extraordinary things, believe in ideas enough to bring them into being….Derek showed me some of the work on your website, by the way–I love it, hope I’ll see it in person some day.